On this page we explain why buying a Chesterfield sofa by VAMA Divani, so you can fully understand the great quality of our product. Let's start from the first stage of processing. 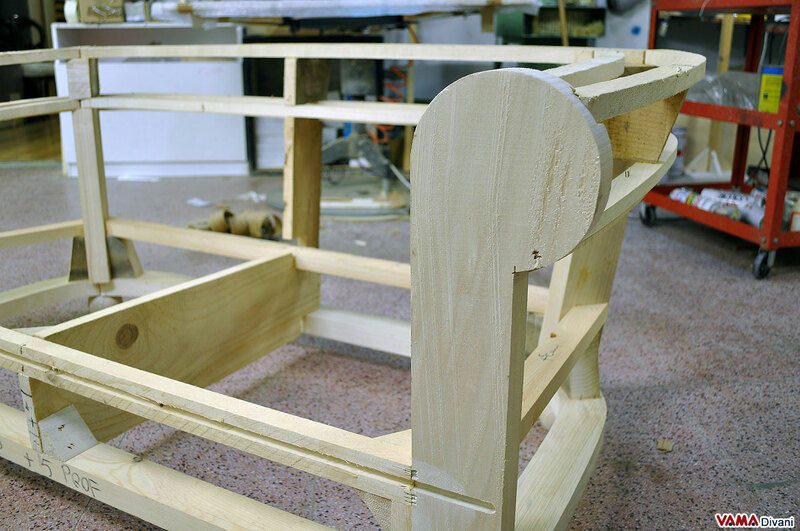 The frame is the internal structure of the sofa and has to be done in the best way and with the best materials in order to ensure resistance and duration of our sofa over time. We use fir solid wood for the whole structure that gives the frame a high resistance and the elasticity that it needs. As you can see from the picture, every part is made of solid wood, the warehouses of our woodworkers do not store poor quality woods or wood composites. The solid wood frame is the key and important feature of our Chesterfield, everything starts from here and must be made in the best way. 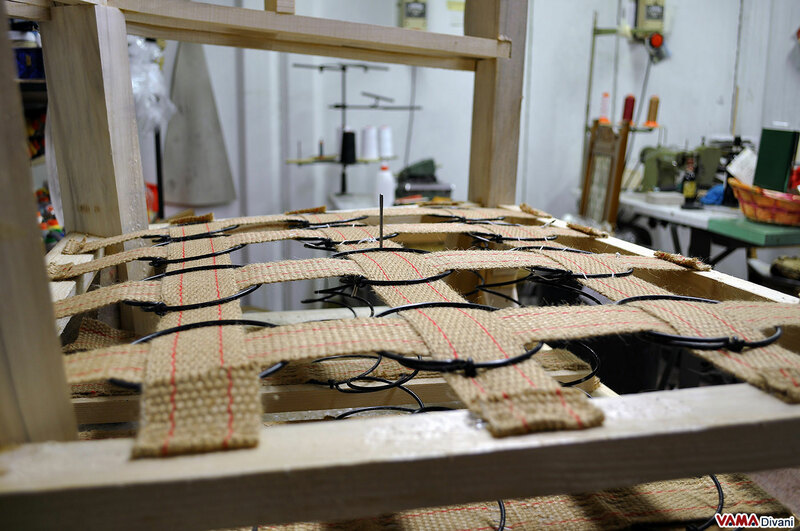 Suspensions are used to support the seat cushions. For the standard Chesterfield sofa, we use high-strength straps that keep the flexible and comfortable seat. We have been using these state-of-the-art straps for many years and the result in terms of durability and longevity is great. Instead, for those who want the "vintage" and traditional hand crafted suspensions, then we can made them with hand-tied steel springs and jute straps as the Italian old craftsmen did in the 19th century, all processes realised with Made in Italy elements and materials. We want to better explain the terms used, because many times we are asked about the difference between polyurethane foam and foam rubber. When we talk about foam rubber, polyurethane foam or foam resin, we are talking about the same product, so there is no difference between these terms. Also in this case, the quality of the materials makes the difference. All the padding is made of "Olmo" contoured foam resins among the best ones available on the market. The dimensional stability is the feature that can be better noticed over time, so we have chosen to collaborate with the best producer. The polyurethane foam used for the buttoned details has a higher density than the foam rubber used for the seat cushions, this feature gives the buttoned details a solid, long lasting and more comfortable seating. There is no doubt that choosing leather requires the utmost care as the market offers many types and qualities of this valuable material. Whenever we receive an order for a sofa, we go directly to our trusted tanneries to select the best leather suited to the production of the Chesterfield sofa. Once selected in the tannery, the leather goes to the cutting table where it receives an additional quality control. As you can see in our catalogue, we offer and use only the best quality leathers. You can find the full-grain leather which represents the top quality, pure aniline with natural grain which is not protected by any fixative product, a very soft but more delicate material. Then, you can find the grain leather which is only one step below than the full-grain leather, but it offers an excellent workability and durability being less delicate than the full-grain one. So, if there are not special needs, usually we recommend the grain leather that provides an excellent value for money and requires less maintenance. The buttoned details and the whole Chesterfield sofa in general, require great and expert skills in the processing that can be acquired over time, thanks to the suggestions and tips handed down by Italian craftsmen from one generation to another. Exclusive buttoned details must be realised with extreme care and the same thing happens with the pleats of the arm worked in a linear and even manner. 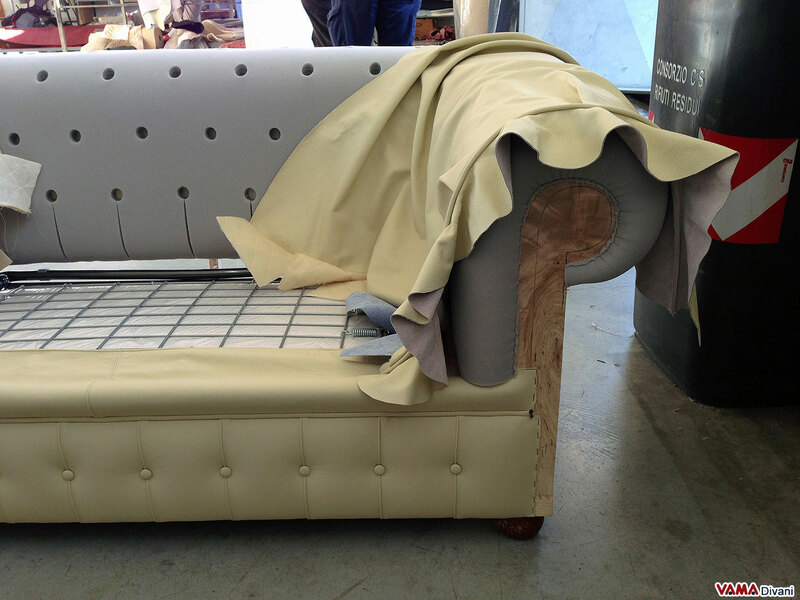 Finding professional buttoned details is not easy, and it is even harder finding an arm treated and cured as that of our Chesterfield. 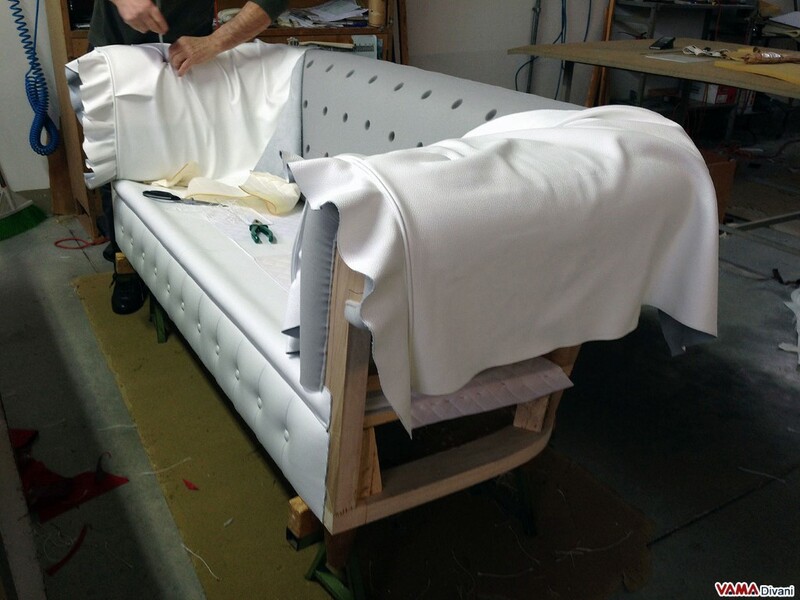 Our Italian craftsmen dedicate great attention and care to every sofa and once finished and ready for shipment, they carry out a final check, so that everything will result perfect and impeccable. 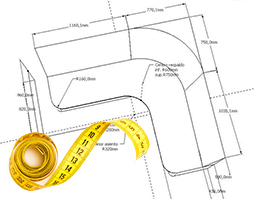 "At VAMA Divani, we are proud to be part of the Italian craftsmanship (the real one)". Our company with workshop and exhibition is located in the province of Arezzo (Tuscany, Italy). Thanks to the global showcase that the Internet offers us, we have arranged for the on-line sale since 2008, offering the shipment of Made in Italy products all over the Europe. Concerning this matter, we have to highlight one key aspect: the packaging. 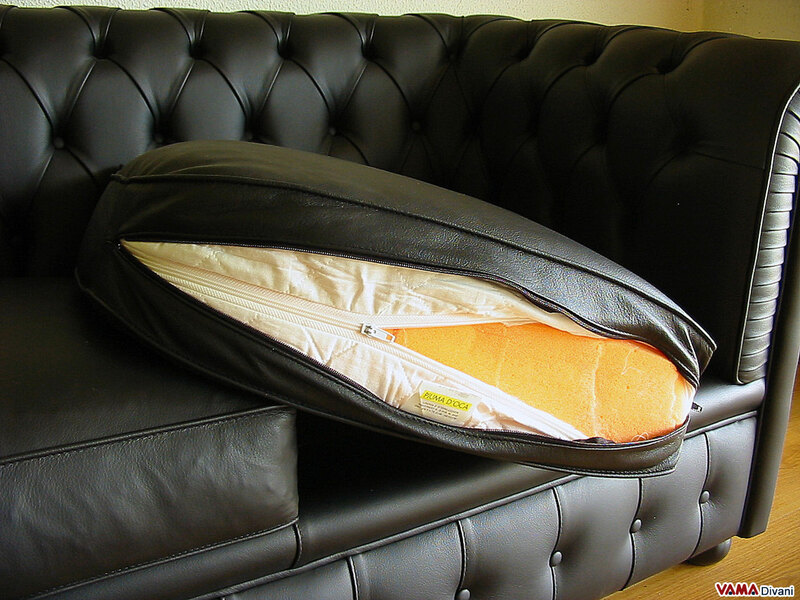 In fact, to ensure a perfect shipping, we pack the Chesterfield sofa with 3 layers. The first layer is in nylon, the second one is composed of bubble wrap and finally, we put the sofa, already well packed, inside a reinforced cardboard box. All these precautions have allowed us not to receive any complaint since 2008. Customer satisfaction is our main priority, we are still part of the "old school" which read: a satisfied customer is the best advertisement. And we commit every day to offer the best possible product as well as a perfect customer service, closely following the sofa from its design to its delivery, because we want our customers remember us even for 10, 20, 30 years! After every delivery, we ask for a small feedback to better understand if what we do represents the right direction or whether, on the contrary, we can improve something.